Every month in Peterborough City and County, 1 in 6 households are forced to make the impossible choice between keeping a roof over their heads and buying enough food. When there isn’t enough money in the budget, rent comes first and food comes second. 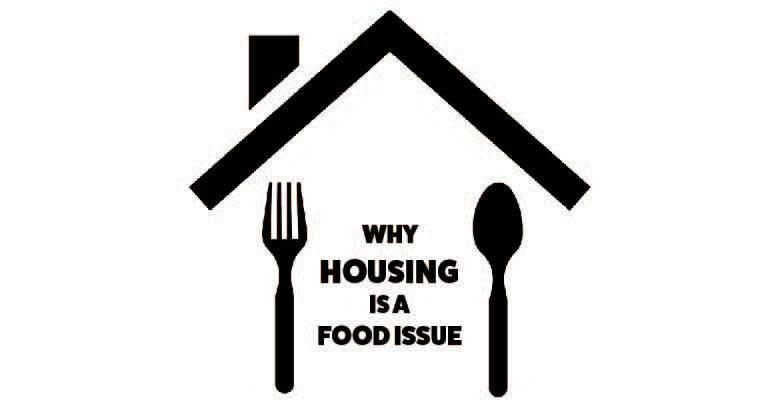 Food insecurity and housing unaffordability are connected issues that share a common root: insufficient incomes. Traditionally a job has ensured food security and housing affordability. It may come as a surprise that the majority of food insecure people in Canada are workers whose incomes come from wages, salaries, or self-employment as shown in the pie chart below. “Job insecurity, poverty-level wages and lack of benefits are the new reality for many Ontario workers whose numbers have grown by 94% over the last twenty years.” (Housing is Fundamental, 2018) Unfortunately, a job is no longer protection against the struggle to afford food and shelter. Every year Peterborough Public Health does research on the cost of healthy food, and compares that research with the experience of residents who are living with different levels of income. In the first column of the chart below, the costs of both necessities are well beyond what is considered affordable. Social assistance rates, just like wages, have not kept pace with rising costs. A single person on Ontario Works spends the vast majority of their income on shelter. If they ate a nutritious diet as well, they would be nearly $200 in debt by the end of the month, and that’s without factoring in any of their other expenses. Shelter costs are affordable when they are less than 30% of a household’s income, as illustrated by the last column regarding a family of four on an average income who only spend 15% of their income on shelter costs. The percentage of income required for shelter for a single person on Ontario Works is a staggering 87%. To afford nutritious food as well would use up another 37% of their income. Obviously, those percentages exceed the individual’s income. This is why 64% of social assistance recipients are food insecure. It is clear that food insecurity and unaffordable housing are growing concerns in our community, regardless of source of income.